J-Tech Digital ® is focused on producing high-quality products that integrate and distribute home entertainment for residential and commercial users. J-Tech Digital has played a major role in transforming whole-house audio, video and home theater for consumers worldwide. 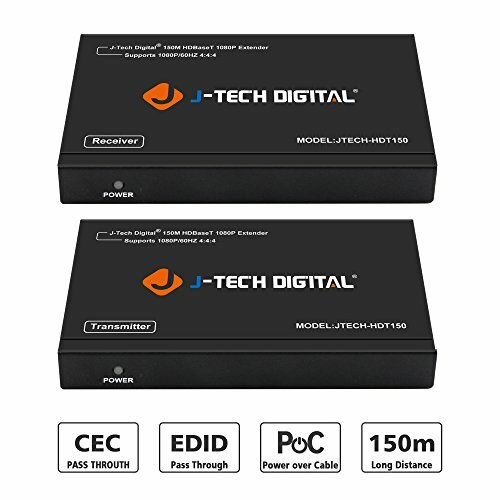 The JTECH-HDT150 extender, can transmit a High-Definition 1080P signal up to 500 feet (150 meters) using the latest HDBaseT transmission protocol. With the JTECH-HDT150 extender, you have many different resolutions options to choose from, including common PC resolutions with 16:10 aspect ratios, such as 1920x1200, so you will not be limited to only “TV-friendly” source devices or monitor displays. This extender is powered by bi-directional POC, and only requires power to be connected to either the receiver or the transmitter, allowing for discreet installation. The JTECH-HDT150 uses an EDID passthrough that will automatically detect which resolutions and audio format are compatible with your display, set them to the highest options available. The JTECH-HDT150 also passes CEC commands, allowing source devices and displays that support CEC to also be turned on or off through the extender. The JTECH-HDT150 also passes RS-232 commands, to control devices for serial communication transmission of data. ✓ EXTEND YOUR HDMI SIGNAL OVER ETHERNET - Extend your 1080P HDMI signal up to 500 feet (150 meters) over Cat5e/6 UTP cable using the latest HDBaseT transmission technology. ✓ GREAT COMPUTER COMPATIBILITY - Our extender supports a wide variety of resolutions including common 16:10 aspect ratios, making them great for connecting desktops and laptops, and displaying to monitors. ✓ BI-DIRECTIONAL POC, EDID PASSTHROUGH - Power is only required one end of the JTECH-HDT150, and with the Bi-Directional POC feature, you can set the power on either the transmitter OR receiver, for maximum convenience. EDID passthrough settings also make for a quick and easy set up allowing you to experience audio and video in the highest settings possible based on the capabilities of your display. ✓ BI-DIRECTIONAL IR & CEC, RS-232 PASS THROUGH & HD AUDIO FORMATS - Control your source from your display/receiver side, or vice-versa with through Bi-Directional IR, source devices and displays can be turned on and off with the JTECH-HDT150 through supported CEC commands, and pass RS-232 commands from a computer to your source and display with a Phoenix jack. The JTECH-HDT150 also supports many HD audio formats, including Dolby Digital, Dolby TrueHD, DTS 5.1, and PCM. ✓ FREE LIFETIME SUPPORT - All J-Tech Digital Products include a One-Year Manufacturer Warranty and free lifetime technical support from our Customer Support Team located in Houston, Texas - Available M-F 9AM-6PM CST - Contact information available on the J-Tech Digital Seller Page.